We are deeply sorry for your great and tragic losses and want to help you. This is a difficult undertaking to provide emergency housing, but we know it is what you need most. Please know that by working with us toward a solution that RVsWithoutBorders.org and TipsFromSurvivors.org are volunteers and that you agree not to hold us responsible for anything we do or don’t do to help you. We promise to give you our best effort to help you find a place to thrive again. To help cover everyone with the right solution for their unique situation, we are trying to offer very affordable RV rental or RV donations to those least able to afford it. 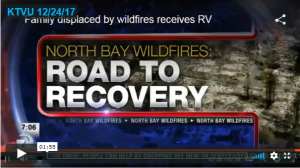 We encourage those with insurance to obtain the normally priced RVs so everyone can be housed. We have developed market relationships with partners adapted to respond to each solution. Together we are learning and adapting. If you have insurance coverage for loss of use while rebuilding or can afford to rent an RV at market rates, please visit here. By sharing what we learned from past experiences in future disasters, we can leap beyond yesterday’s wisdom. ~ Thanks for visiting!